William Picker (born Helpringham c1821) married Elizabeth Johnson from Fulbeck in 1855; she was about 14 years younger than him. After he died in 1879 Elizabeth continued his carrier business. She had several children, including the eldest son (William) who was an ‘imbecile’ and the eldest daughter Mary Hannah. Mary also worked as a carrier and in 1875 she had a son, Harry Warren Picker (Warren was probably the father’s name as she wasn’t married). By 1891 Mary seems to have died and Harry (15) was living with his grandmother in Fulbeck and working as a stable boy for Colonel Fane at Fulbeck Hall. Soon afterwards he moved to Caythorpe where he became 2nd horseman for Major Royds MP. In 1901 he was boarding with George Rawding in Caythorpe. In 1911 he was back with his grandmother in Fulbeck and working in the ironstone quarries. He also worked on the farm for Mr T. Dickens of Fulbeck. He regularly followed hounds with Major and Mrs Royds and was a keen sportsman and cyclist. In July 1913 he was fined 2/6 for drunkenness in Fulbeck. 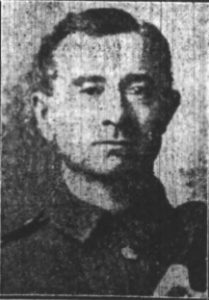 He volunteered for the Royal Engineers at Lincoln in 15 Sep 1914, giving his occupation as groom, and served in France as a driver with 97th Field Company from April 1915. He was killed in action on 26 Jun 1916 and buried at Ville sur Ancre. His effects and (after the war) his medal were sent to his mother’s younger sister Elizabeth Todd (nee Picker) in Wakefield. Apart from her his only known relative was his great aunt Harriet Blackbourn (nee Johnson) who had lived near them in Fulbeck.